This was a great debut issue introducing our new Spider-Man, Miles Morales. A fun issue for all ages and spectacular art. I am hoping for some more distinction between Miles and Peter in future issues. There is a new Spider-Man in town and our Sammy Rendon is here to break down all of the action for you in our ComiConverse review of Spider-Man #1 by Marvel Comics. Spider-Man is Miles MoralesÂ in issue #1 of Spider-Man! 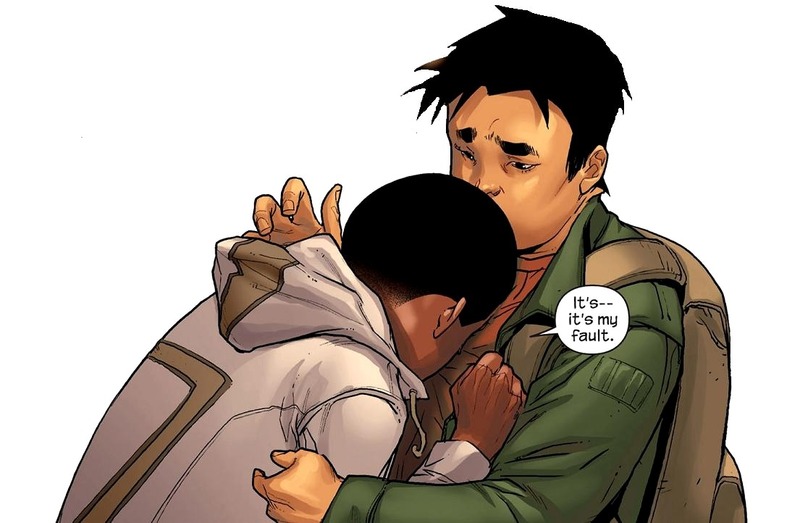 The heir to Peter Parker's title has been filled by Earth-1610 resident Miles Morales, leading up to the events fromÂ MarvelsÂ recent Secret WarsÂ where Miles made the transition to our earth. Peter Parker has faith he will "do great" as Spider-Man but is the Marvel universe ready for him? New school, new villains, not to mention a new earth. Miles is at a slight advantage tho considering his abilities as Spider-Man are a lot more enhanced than Peter's but lacks worldly experience and wisdom, being that he is only a teenager. 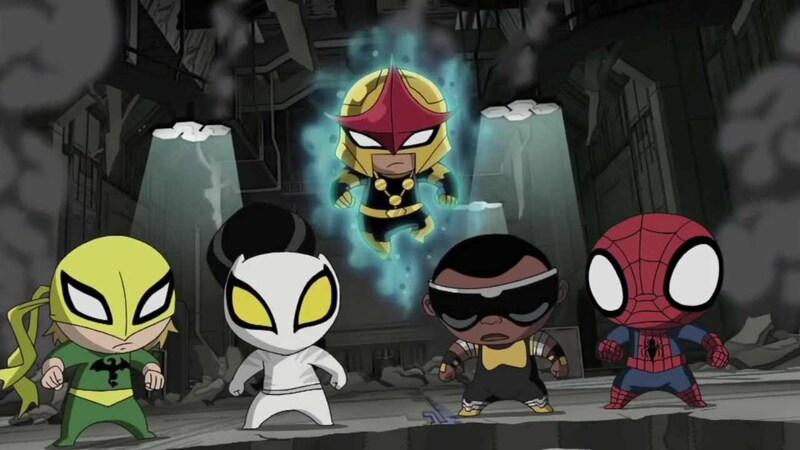 Since Miles has taken on his own version of a Spider-Man uniform, he has become an Avenger and now has his own comic book run. Lets swing into the action premiere comic book, Spider-ManÂ Issue #1. Brian Micheal BendisÂ is the "father"/creatorÂ of the Miles Morales Spider-Man. 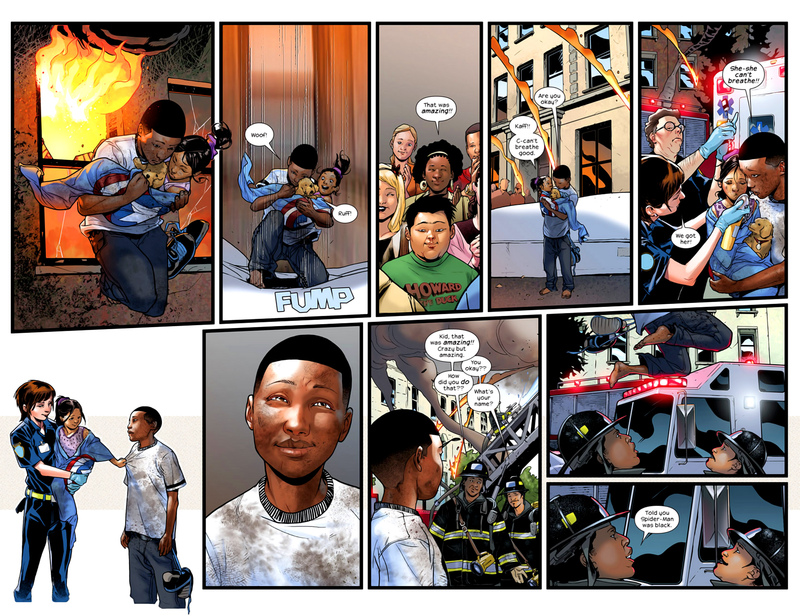 Bendis is on the written script and our other Miles Morales co-creatorÂ Sara Pichelli is on art. accompanied by Justin Ponsor on colour. Miles Morales is in his new residency in a rebornÂ earth. In this earth, Miles now has his parents back,Â but a concerning mother comes with the territory and she confrontsÂ him over the phone regarding his less than stellar grades. Miles, now being the new friendly neighborhood Spider-Man, has other obligations than studying; people to rescue and villains to stop. His first major super villain has arrived or risen rather, from some demonic realm; the villain's name isÂ Blackheart, and he just single-handedly defeatedÂ The Avengers! Spider-ManÂ Issue#1 is a title I and a lot of other comic book fans have been anticipating since it was announced last year. Miles Morales is now THE Spider-Man of New York, while Peter Parker has ventured out globally, and Spider-Man's debut is as solid as they come. Whether this is your introduction to Miles Morales or you're a seasoned reader, this issue has you covered. Miles starts off his debut being led by his teenage hormonal instincts, pursuing a girl he blew off due to him detaining another villain. Following the exchange of words, Miles' buddy,Â Ganke Lee, catches up to him for suggestions on who he should be dating and gives us some hilarious dialogue. Ganke is the only person who knows of Miles' secret identity asÂ Spider-Man.Â Ganke is one of Miles very good friends and a fun character in every sense of the word. This character will continue to support Miles in his real life issues and keep Miles grounded when he needs it. Ganke offers anÂ important supporting role in Miles hectic life. Later, during class, an ambulanceÂ interrupts his studies and the interruption is enough to set off Miles' Spider-Sense. He ditches class in front of the teacher to become Spider-Man and investigate the danger. This is an important panel, because it shows that Miles has put his Spider-Man duties before his studies and furthermore, he has developed a god-complex of sorts. On his way towards the sirens, he amuses himself with the idea of working as a Spider-Man for children's parties, which brings up the question; what will our new hero do for money? His parents are alive, so they will provide for him, but if he does need to work will he sell photos of Spider-Man for money? Personally, Â I hope he walks the path of the unfamiliar and he becomes a volunteer at a Boys and Girls club or something of that nature and becomes a mentor. That would open up his story for a lot of reflecting and responsibility on Miles' part, and we all know "With great power, comes great responsibility". Spider-Man follows the sirens that lead him to an explosion in a downtown area, Spider-Man makes it a priority to help children out of a school bus that he cradled in a web like hammock. Miles helps the children one by one until a citizen suggest that he aid those near the explosion and allow the crowd help with the children. This was a great display of support from the people of New York for Spider-Man and at the same time affirming Miles god complex with him always multi-tasking, attempting to save everyone. The explosion comes from fellow Avenger, Sam Wilson's Captain America fighting a Guillermo Del Toro inspired Blackheart, while the rest of The Avengers are lying in aÂ concrete rubble, too injured to move. Miles uses his venom blast to defeat the creature showing new readers his ability and showing loyal readers he still has the abilities that helped us fall in love with him. During the battle with Blackheart, Miles takes a page out of Peter Parker's Spiderman and speaks to his opponent the whole fight. Toying with him to aggravation and attempting to pull out as much information he can. Yes, it was amusing and fun to read, but Spider-Man is a separate title run and Miles Morales is not Peter Parker so why make them similar? It felt a bit disrespectful to Miles not to make him his own person and not treat him as an individual; I sure hope they don't treat this comic book run like a soft reboot and begin to bring some distinction between Peter and Miles because they didn't need to do that with Spider-GwenÂ and her character traits so why with Miles? The only explanation I could think of is that their are trying to make the transition from Peter to Miles as smooth as possible for fans, but I feel Miles is an intriguing enough character with a well supported cast to keep our interest. Another point in this issue that gnawed at me was how it started, with The Avengers lying in a wreck and Blackheart demanding Spider-ManÂ to bend his knees and surrender, and then the next page began with an "earlier that day..." cliffhanger. I felt that this type of "hook scheme" wasn't necessary because without that opening scene it would have opened up with Ganke and Miles dialogue about dating, that back and forth dialogue was rich! It was funny and interesting enough to keep audiences reading. I felt as if Marvel didn't trust this tittle enough from the buzz it was receiving so they had to find another way to ensure audiences attention. If that was the case, why give Miles his own title in the first place? Here is why I feel the "Earlier that day" format took away from the story. Despite the two faults I found with this issue, the good outweighs the bad and was a solid execution. Brian Micheal Bendis wrote up an awesome script, giving audiences an issue for everyone to enjoy. I for one am not a huge fan of the cute Ultimate Spiderman cartoonish characters that show up in daydreams but it wasn't a distraction Â in this book, if anything it showcases miles immaturity in his struggles of being Spider-Man. When I think of an artist in comic books I consider them being a movie director, because they are visually guiding us through these characters lives. Ultimately what they show ends up on-screen/panel like a director does in a movies final cut. So when the camera is in Sara Pichelli'sÂ hands if you will, we are put in full swing and taken along for a thrill ride. The pencil sketch style Pichelli bring's is a lost art in a genre where pencil drawings should be expected but with everything gone digital, it's not that common. It's refreshing to see this type of art make its way to Spider-Man. Her take on webbing is originally and uniquely her own and the agile and contorted poses Spider-Man makes on panel are heroic and very Spider-Man defining. Now to answer my own question, is the Marvel universe ready for Miles? The answer is a big, huge YES!